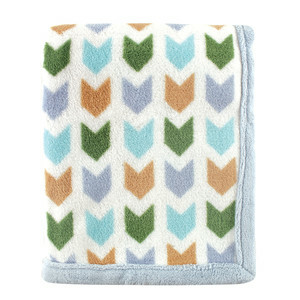 Hudson Baby Chevron Printed Coral Fleece Blankets are sure to become your baby's favorite snuggle-time accessory. Generously sized at 30x40", this blanket is big enough to cover your little one in the crib on chilly nights or to keep them safe from a cool breeze in air conditioning, and small enough for a toddler to tote around as a security blanket. Printed with a vibrant and modern chevron pattern, the blankets feature a solid band of fleece binding around the edges to protect from fraying in the wash. 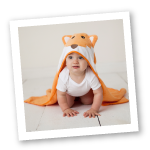 The extra soft 100% polyester fleece features a texture that feels wonderful against baby's delicate skin, and is bound to please even the most picky of babies. The blanket is packaged on a hanger and tied with a ribbon for a quick last minute gift or addition to a gift bag.